Correspondence sent by Mrs F.N. Atkins (Blacksburg Woman's Club President) to Sargent Shriver in the Office of Economic Opportunity (Washington D.C.) on May 3, 1965 expressing the support of the Blacksburg Woman's Club for the Montgomery-Floyd Community Action Organization's grant request to assist "disadvantaged families in this area." Researchers wishing to cite this collection should include the following information: Blacksburg Woman's Club Records, Ms1963-002 - Special Collections, Virginia Polytechnic Institute and State University, Blacksburg, VA.
Atkins, F.N. (Mrs), “Correspondence, Mrs F.N. 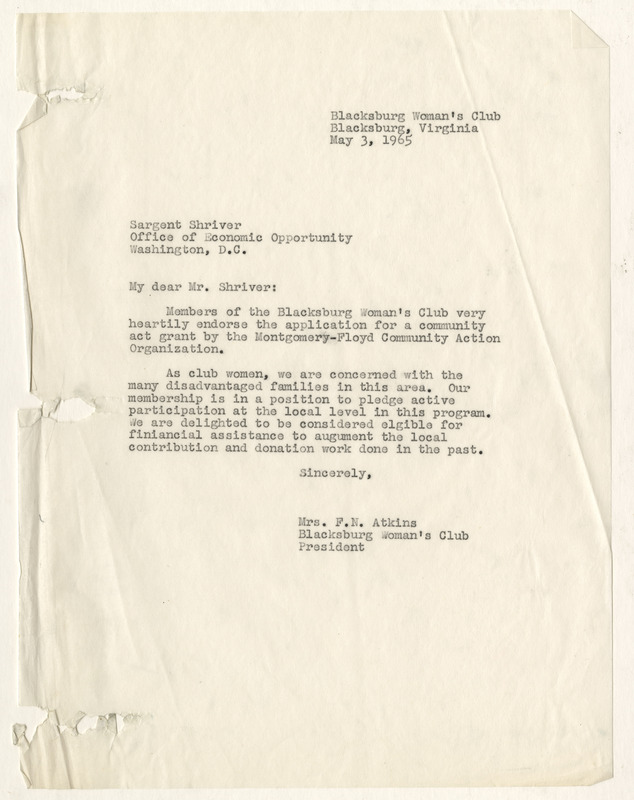 Atkins [Blacksburg Woman's Club President] to Sargent Shriver,Washington, D.C., May 3, 1965 (Ms1963-002),” VT Special Collections Online, accessed April 23, 2019, http://digitalsc.lib.vt.edu/Ms1963-002/Ms1963-002_BlacksburgWomansClub_B1F1_Correspondence_1965_0505.